DUBAI, UNITED ARAB EMIRATES – Perhaps it was the stretch out in distance, perhaps it was her inside draw, or perhaps it was just her night. 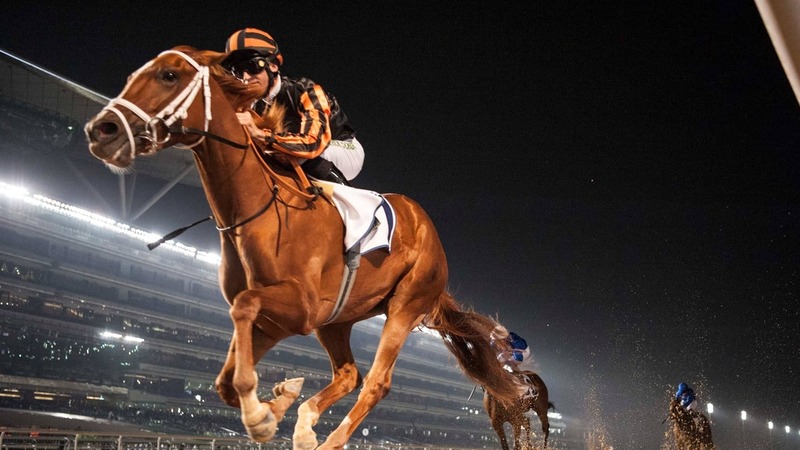 Whatever it was, the American-born Rayya finally got the best of her foe Winter Lightning in Thursday’s Group 3, $250,000 UAE Oaks at Meydan Racecourse. Breaking sharply from post 1 under Pat Dobbs, Rayya refused to let the heavily-favored Winter Lightning get over from the far outside. The Doug Watson-trained filly took command heading into the far turn and continuing to ride the rail down the back straight. Continuing to hold a 1-length lead into the far turn, Dobbs remained still aboard his filly with plenty left in the tank. Kicking away at the top of the stretch, Rayya steadily increased the distance to her foes, cruising home to win the 9 1/2-furlong main track event by 3 1/4 lengths in a final time of 1:59.68. Rayya’s win was her first since breaking her maiden in December. She was then second behind Winter Lightning in her subsequent two starts, stakes events at 7 and 8 furlongs here at Meydan. Godolphin’s Expressiy, the third-place finisher in each of those races, was also able to get the best of the heavy favorite, finishing second by 4 1/4 lengths. Winter Lightning never made a move down the stretch and almost finished off the board, taking third over Sa’ada by a head. Queen Estoril and Line House completed the order of finish. The UAE Oaks is part of the Road to the 2018 Kentucky Oaks prep race season. Rayya earned 50 points for the win, with Expressiy receiving 20 for second, Winter Lightning 10 for third, and Sa’ada 5 for fourth. Following Rayya’s win, the UAE Derby at the end of March could be the next target for the daughter of Tiz Wonderful. Depending on how she progresses, don’t be surprised if her connections ultimately ship her across the ocean to run at Churchill Downs on the first Friday in May. Rayya returned $9.20 to win, $3.80 to place, and $5.40 to show. Expressiy brought back $5.80 to place and $6 to show, while Winter Lightning paid $2.10 to show.